In this unique and cheerful cafe, you'll find casual elegance and a charming French Coastal atmosphere with upscale tastes at affordable prices. 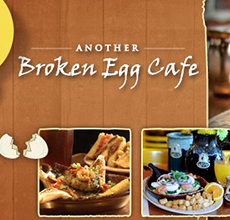 Another Broken Egg Cafe offers exceptionally fresh and nutritious food with over 90 menu items, specialty coffees, award-winning, top shelf Bloody Mary's and Mimosas to choose for your Breakfast, Brunch and Lunch experience. Serving breakfast all day, this unique menu highlights six different benedicts, awesome omelettes, traditional brunch dishes, along with hot sandwiches, fresh salads and a host of signature dishes, such as Blackberry Grits and Banana's Foster French Toast & many new unique healthy choices as well. 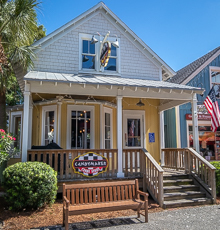 Voted "Best of the Best" on Florida's Emerald Coast twelve years in a row, this highly decorated cafe concept evokes southern hospitality at its best! Enjoy traditional and speciality grilled cheese sandwiches and full lunch and dinner menus in a casual, family-friendly environment. A full bar offering panoramic marina views and breathtaking sunsets from our upstairs deck. 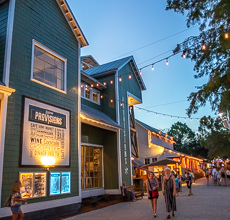 Also grab everyday necessities, groceries, gourmet grab 'n' go items and local fresh goods at the general store. Open every day. 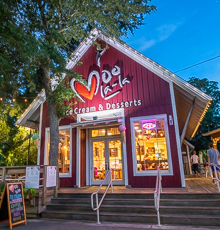 Co-owned by nationally recognized restaurateur and Floridian Chef Jim Shirley. We offer accommodations for private events. 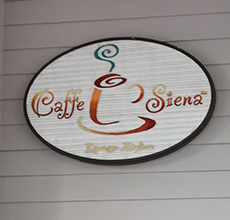 Caffe Siena at Sandestin, a convenient coffee shop at the entrance of The Village of Baytowne Wharf. Serving fresh coffee, cappuccino, and pastries. Authentic Southern candy kitchen preparing delicious treats right before your eyes, including: pralines, salt water taffy, fudge, candy and caramel apples, hard candies, and all sorts of chocolates and freshly roasted nuts. 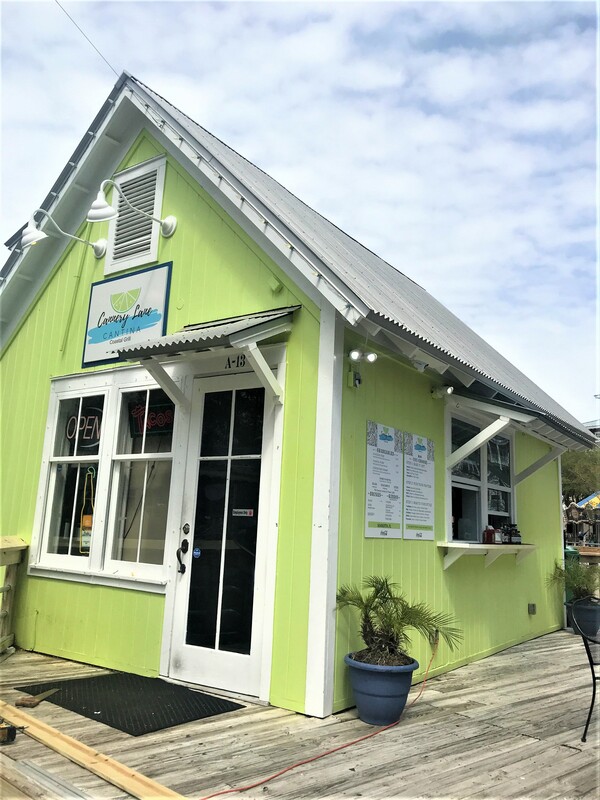 Baytowne's own Coastal Grill and Cantina, stop by and experience one of our Mexican and Caribbean inspired style of tacos, burritos, bowls, and quesadillas. Live life to the fullest with our shareables, such as our fresh Avocado Fries and top it all off with a refreshing beer or sangria. Let's all Toast to the Coast Life! 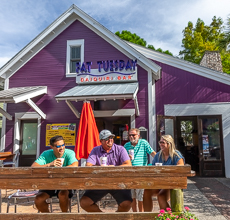 Fat Tuesday Daiquiri Bar, the famous New Orleans daiquiri and frozen drink bar, serves up specialties at The Village of Baytowne Wharf. Enjoy frozen concoctions like 190 Octane or the Hurricane each blended, chilled and served to cool the summer heat. Fat Tuesday will also serve up wings and snacks to munch on while you catch the big game on the flat-screen televisions or test your skills on an interactive video game. Connect with Fat Tuesday on Facebook! Come enjoy this dockside Bar & Grille serving Fried Baskets, Steamed Seafood, Burgers and accompanied with Ice Cold Beers and Cocktails. Relax overlooking the Choctawhatchee bay to Live Music in a Family/Pet friendly ambiance. 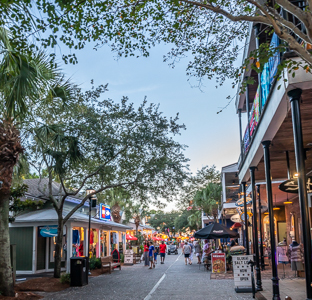 Located in the Village of Baytowne Wharf within the Sandestin Resort. Open Daily from 11am-until the fun stops. For private parties or large groups, contact Melissa Tusa, Event Coordinator, for details. 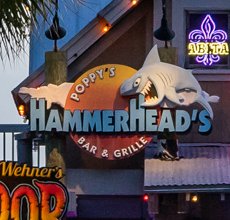 Connect with Hammerheads on Facebook! Hartell's Village Diner is a classic 50's diner that features a full service menu including breakfast, lunch, dinner, dessert and late night. Come in and see Bob Bodiker's World Famous Sweet Shop with an ice cream bar built atop the front end of a 1957 Chevy. With family friendly food and family friendly prices, Hartell's has something for everyone. 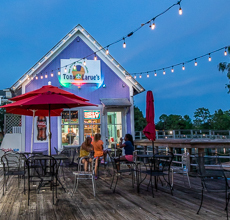 Located in The Village of Baytowne Wharf, just look for the 6 foot double cheeseburger and come in for a treat! To-go orders available. Connect with Hartell's on Facebook! 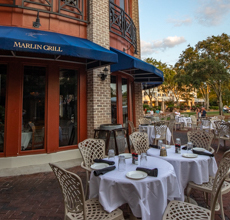 Casual, upscale fine dining, Marlin Grill is open for dinner and specializes in the freshest catch-of-the-day specials, seafood and grilled steaks. Enjoy a cocktail or martini at the bar or a takeout cigar. Two level outside terrace seating available. Large groups welcome. Connect with Marlin Grill on Facebook! Indulge in a variety of 24 rich ice cream flavors served in an array of styles, traditional soft serve or ever changing yogurt flavors. You can also enjoy a selection of eclectic and scrumptious desserts, chocolates and pastries. All served in The Village of Baytowne Wharf. We invite you to enjoy Fresh Local Seafood along with some of our Creole & Cajun Favorites while overlooking the beautiful Choctawatchee Bay. 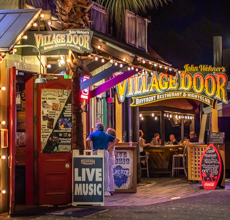 Located in the Village of Baytowne Wharf within the Sandestin Resort. Open Daily from 11am-until the fun stops. Private Parties up to 300 guests are welcome. Contact Melissa Tusa, Event Coordinator, for details. Enjoy the sun setting from our second floor balcony overlooking the Bay, while enjoying great service, delicious seafood and steaks and an extensive list of wines and signature cocktails at Poppys. Connect with Poppy's on Facebook! 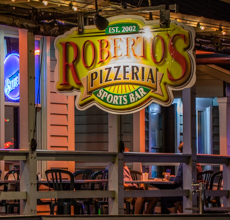 Nestled within the Village of Baytowne Wharf serving the best Gourmet Pizzas, Pastas, Calzones, Stromboli's, Salads, wings, and more. This casual family friendly Pizzeria has plenty of indoor and outdoor seating, Full Bar, Big Screen TV's, and great Drink Specials. Whether it's to catch the big game or bring the family and friends for a pizza party, this is the place to be. Open Daily from 11am-until the fun stops. Private Parties are welcome. Contact Melissa Tusa, Event Coordinator, for details. Connect with Roberto's Pizzeria on Facebook! 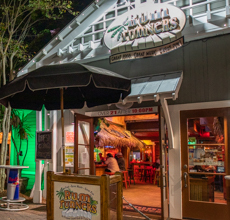 There is nothing like the delicious food and live entertainment at Rum Runners featuring Great Food, Great Music and Great Fun. Home of the the "World Famous" Dueling Piano Players performing all the hits from the '50s to today each night with high-energy, crowd interaction and fun. Voted "Best of Destin Casual Dining 2012." And, don't forget about the sports bar upstairs, a great happy hour spot with outdoor patio seating overlooking the Events Plaza. Perfect for your next corporate group event, birthday, bachelorette party or bachelor party. Connect with Rum Runners on Facebook! 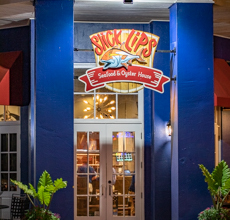 Derived form the nickname given to Amberjack who don't have any teeth, Slick Lips is a family-friendly seafood restaurant and oyster bar. With a key concentration on fresh ingredients, locally caught fish, and an assortment of fresh oysters, prepare to be hooked on this prime dining spot! What better way to cool down than with a New Orleans style snoball? Stop by Tony Larues for a variety of snacks! Munch on kettle corn, cotton candy, popcorn and, of course, a New Orleans Snoball! With a wide variety of flavors and a fun New Orleans vibe, you will be coming back for more of these tasty treats. Connect with Tony Larue's on Facebook! 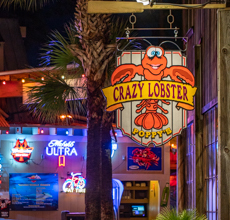 Baytowne's family-friendly restaurant offers great Bar-B-Que and seafood with a great Sunset View! All meats are smoked in-house daily. Five different award winning BBQ sauces are available at your table. Other favorite seafood selections include Snow Crab legs, Blackened Grouper and Fried Shrimp! Start your dinner with one of our tasty appetizers such as smoked tuna dip, boiled shrimp, fried dill pickles or our famous smoked chicken wings just to name a few. Then feast on our fresh smoked Bar-B-Que Brisket, Baby Back Ribs, Pulled Pork and Smoked Chicken. Enjoy bayside dining while sipping one of our large signature drinks, daiquiris, a glass of wine or an iced cold beer from our extensive craft beer selection. Or dine inside and watch your favorite sporting events in the air conditioning until our famous nightclub turns up the music. Be sure to stay and enjoy our famous nightclub as the dance floor heats up! Connect with The Village Door Bayfront Restaurant on Facebook!